I have to confess that I am still making it around to read the links at the Scraptastic Tuesday link up, while my partner in this venture, the lovely Nicky from Mrs. Sew and Sow, has been able to visit them as they have been posted. I am so enjoying visiting each link, thank you all for joining Nicky and I in this Scraptastic Tuesday venture. We have sent emails to the winners but if you read it here first, please contact us so we can get the prizes on the way to the winners. In other news, there are some beautiful posts about the Modern Quilt Guild showcase at the Houston International Quilt Festival. Check out Christa's post at Christa Quilts here, and the MQG blog post here. I was not able to go to Houston as I had planned so seeing these posts is a lovely alternative - you can see my quilt Cycles 2 right there in the middle right, what a beautiful display. 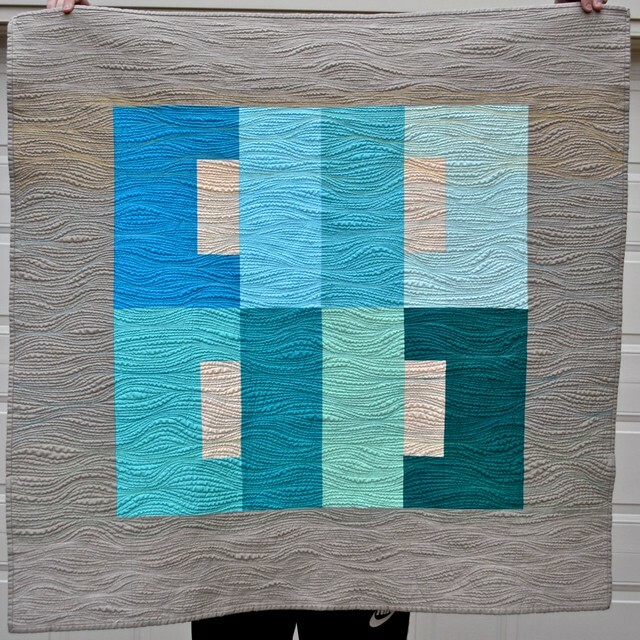 I shared my first finished version of my new quilt pattern - the pattern is called Consider - yesterday, for the Bloggers Quilt Festival. Peace is a baby quilt size of the pattern. I will be sending this pattern to pattern testers no later than Monday and although I have some pattern testing volunteers already, I though I would make one more offer, if you would like to be on the pattern testing list please let me know in a comment or by email. And if you have not yet entered, there is a fantastic give away of the she can quilt blogger's bundle sponsored by Fabric Spark open until 6 pm tomorrow, go here to enter. Well, I'm off to work and even to the theatre tonight. This is a lovely quilt! If you need another pattern tester, I would be happy to help out! Let me know. My e-mail is sew4given AT aol DOT com. Thanks! Thanks so much, Leanne and Nicky (and sponsors)! Love your new, or somewhat new, blog format. I'd love to test your new pattern! It looks great. Thank you for the bundle of fabric from Fluffy Sheep! I would love to be a pattern tester for you!